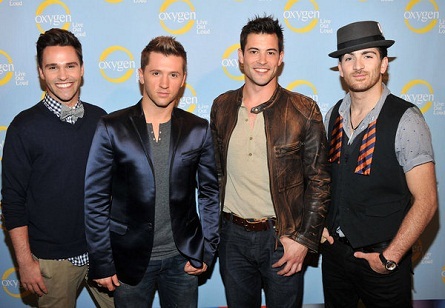 Press Release, NEW YORK – July 26, 2012 – Oxygen Media will dance onto television screens with its new docu-series “All The Right Moves,” premiering on Tuesday, July 31 at 9 PM. The series chronicles the journey of four of the most successful and sought-after dances in the industry – Emmy®-nominated choreographer Travis Wall (“So You Think You Can Dance”), Emmy®-nominated choreographer Teddy Forance (recently featured on “Dancing With the Stars” as dancer and choreographer), Emmy®-nominated choreographer Nick Lazzarini (winner of “So You Think You Can Dance” season one) and Kyle Robinson (Julliard-trained and recently featured on “Dancing With the Stars”) – as they launch SHAPING SOUND Dance Company. Viewers can join the discussion each week using @ATRMonOxygen and post their thoughts on the dancers and the drama using #ATRM. Fans can like the series on Facebook at http://www.facebook.com/AllTheRightMovesOxygen. The premiere episode kicks off with Travis, Nick and Teddy diving head first into starting their business after years of dreaming about the launch of a contemporary dance company in Los Angeles. However with the competitive world of dance, the guys quickly find themselves knee deep in a power struggle with their friends and peers. Taja, Travis’ protégé, challenges his position as leader while newcomer Kyle questions his role in the company. Meanwhile Jaimie, Travis’ best friend and fellow “So You Think You Can Dance” alumni, longs for a spot in the company after a debilitating knee injury.